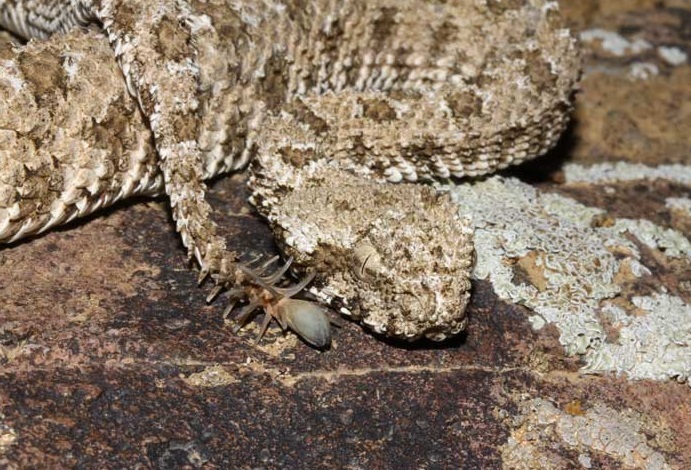 For some, it's the stuff nightmares are made of: a predatory combination of snake and spider. Luckily for those more inclined to lose sleep over such things, it's not as bad as it initially sounds. There are no spider-snake hybrids sliding and skittering through the undergrowth – but we can present you with a snake that has a "spider" for a tail. Allow us to explain. The spider-tailed horned viper (Pseudocerastes urarachnoides) makes its home in the wilds of western Iran, where it lies in wait for its winged prey of choice. But unlike many other incredibly patient ambush predators, this viper has a mind-boggling trick up its sleeve (or in this case, in its tail) to speed up the process. As the viper's name suggests, the tail closely resembles a spider, legs and all. Remaining motionless and well camouflaged, the snake begins to wiggle the tail, moving the conspicuous "spider" in patterns that make it appear to be scuttling across the ground. To avian eyes, the spider-shaped "snack" can be simply irresistible, especially when the birds have hungry mouths to feed back at their nest. If temptation proves too much, a bird will swoop in for the kill – and encounter a nasty surprise instead. The hunter becomes the hunted as the waiting viper strikes with incredible speed. The distinctive shape of the viper's tail had previously been noted when the species was discovered and described in 2006, but scientists confirmed their suspicions only recently, with a study led by Iran's Yasouj University. A team engaged in long-term observations of the snake was finally able to witness and film the unique ambush behaviour, and confirm the use of the spider-shaped lure. Known as a caudal lure, it's a form of mimicry that predators from all corners of the globe use to entice prey closer. Famous examples include the bioluminescence used by the fearsome deep-sea angler fish, an irresistible light dangling in front of waiting jaws. There's also the delightfully named tasselled wobbegong (Eucrossorinus dasypogon), a shark that rests on the seabed, moving its tail in a manner that resembles a small fish. Prey lured in by the movements is quickly dispatched. Other snakes, too, have simple caudal lures on their tails – but the horned viper is the first to take things to such an extreme, spider-mimicking level. The "spider" structure itself is vastly different from the keratin-based tail rattles of the infamous rattlesnake. Instead, the team behind the discovery reports that it is made entirely of soft tissue, including a highly conspicuous swelling of the tail to represent the spider's body, and a lengthening of the scales around it to create the devious creepy-crawly legs. As the video shows, the viper's strike is devastatingly fast (recorded during the study at just 0.2 seconds! ), so birds that get too close stand little chance. But here's an interesting twist: it turns out that not all birds fall for the viper's trickery. The research showed that avian locals were not so easily fooled, and only birds migrating in from elsewhere ended up as snake food. And it isn't all easy for the horned viper. The researchers reported the occasional calamity in their observations – moments when the "spider" was pecked off by particularly determined birds, leaving the snake to resort to less spectacular ambushes in the future. What in the deep blue sea is this fish-snaring swirl of bubbles?